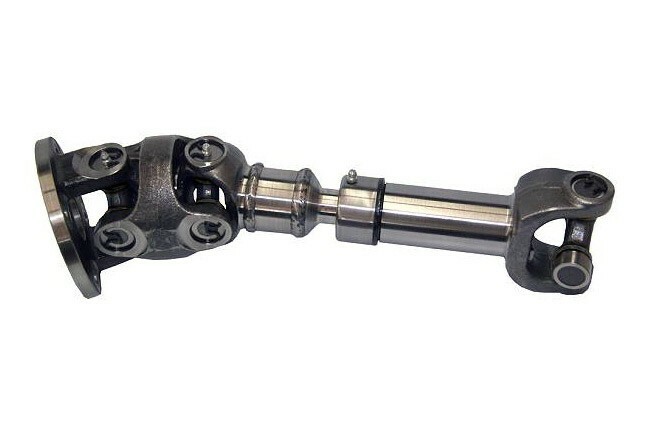 This double cardan style CV drive shaft is recommended for Jeep TJ Rubicon models equipped with 4in - 6in suspension lifts to prevent driveline vibration and the rear output shaft from breaking. This drive shaft will flex to a nominal 30°s prior to binding and is a direct bolt in replacement that does not require removing the factory original out-put mass vibration dampener hub. It is built on a 3in tube diameter and uses the stock 1330 sized universal joint at the rear differential end. Flexes to a nominal 30°s prior to binding. Does not require removing the factory original out-put mass vibration dampener hub. ONLY fits 05-06 Unlimited Rubicon models.